Do you need a fast and easy way to synchronize your files and folders between computers? Do you have a Laptop or Tablet that you want to synchronize with another computer? Are you tired of dealing with complicated programs, network settings, and passwords? Then you need Easy Computer Sync. Easy Computer Sync lets you effortlessly synchronize your important data between computers, so your computers always have the most up to date files. Using the industry standard USB Easy Transfer Cable, it lets you transfer data at blazing speeds, up to 480Mbps. Easy Computer Sync is the first and only software product designed exclusively for the the Easy Transfer Cable, making it one of the easiest products to use. 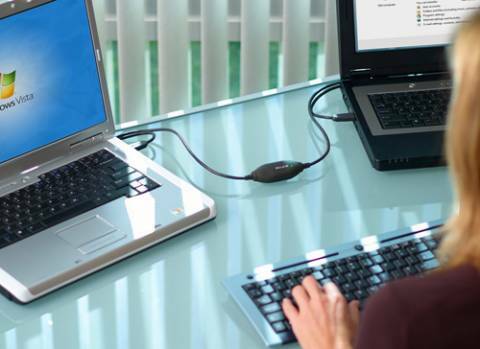 If you own a Laptop, Netbook, or other portable computer, you'll find Easy Computer Sync to be an essential tool for your digital life. On most computers, it's the fastest way to transfer data, period. The USB 2.0 Easy Transfer Cable provides the fastest possible transfer speeds for most computers. 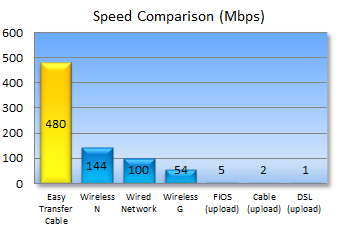 In fact, it's over 200 times faster than using your typical "high speed" cable internet connection to transfer data. You don't have to worry about bandwidth charges from your Internet Service Provider, or Internet security problems, since data is transferred using the Easy Transfer Cable, not over the Internet. To put this speed advantage in perspective, if you wanted to transfer a typical 4 gigabyte HD movie between computers, with Easy Computer Sync it would take approximately 1 minute, 10 seconds. With a typical "high speed" cable internet connection, it would take 5 hours and 30 minutes. Also, if you just want to copy a few files and folders between computers, it's easy with the included "drag and drop" feature. Or, if you just bought a new computer, you can use the "transfer" feature to transfer all of your data from your old computer to your new computer. 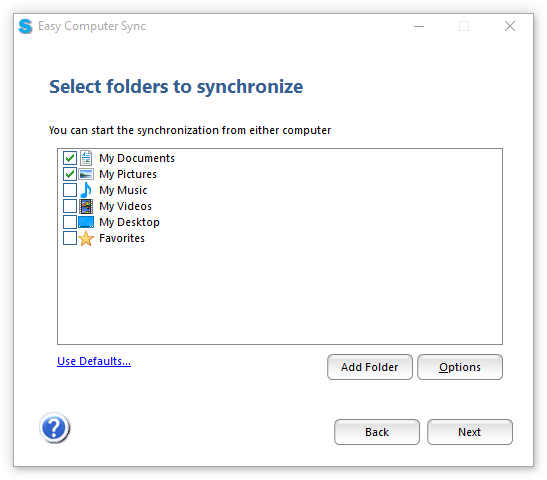 Easy Computer Sync includes advanced synchronization features and settings for those who need them, but keeps it easy to use for the rest of us. Easy Computer Sync works on Windows XP, Windows Vista, and Windows 7, 8, 8.1, or 10 (for both 32-bit and 64-bit editions), and will work between any combination of these systems. Buy Easy Computer Sync today, and start transferring data at blazing speeds!